Ionic PK Boost (14/15) is used throughout the blooming and fruiting phase for larger more robust crops. 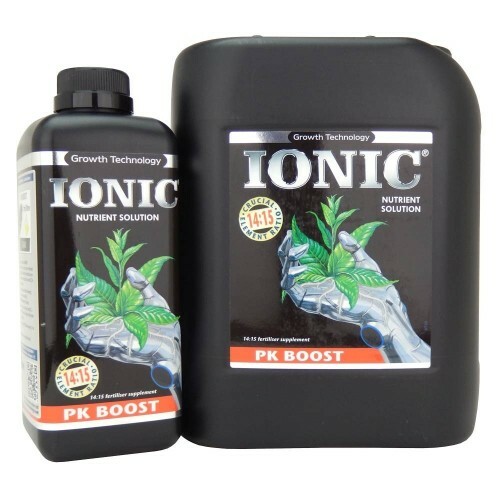 The much needed Phosphorous and Potassium along with added iron in Ionic PK Boost propels optimal fruiting and flowering of ultimate quality and quantity with higher potency during the flowering stage when these extra nutrients are needed the most. Ionic PK Boost is a heavy flowering and fruiting booster that can be used in any grow medium and substrate except for organics. You can use any one of the Ionic nutrients such as Ionic Hydro Bloom, Ionic Soil Bloom or Ionic Coco Bloom for the best crop yields and quality that will amaze even the most professional of growers. Give your plants power during their fruiting and flowering stages with Ionic PK Boost with all pure, natural mineral compounds for higher quality, quantity and most potent crops. Ionic Coco Bloom Ionic Coco Bloom should be used during the flowering or fruiting phase of your..